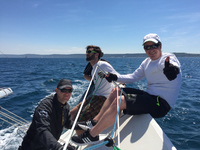 We had another great sailing day onboard Pila, Justin Ten, at One Sails Cup on Slovenian coast. This time we had a special kind of regatta with only one start that included navigation from Izola to Portorož and back that was immediately followed with sausage course. Later was sailed until the end of the time limit of 4 hours. We started in the fleet of 25 boats, 5 in our class. We managed to finish 10th overall, but last in our class. As can be seen from the photo, we really enjoyed ourself - the position of our strongest team member is for photo purposes only.